Corporate revenues have been crummy all year, with many companies seeing actual declines. It has infected a wide range of sectors, though a few, such as the auto industry – both manufacturing and retail – are still booming. Even the tech sector has been singing the revenue blues. But revenues are brushed off by the markets these days as irrelevant. When a revenue debacle is reported, it might take down the company’s stock for a few days, but then it crawls back up. Because, forget revenues. What matters is earnings growth. 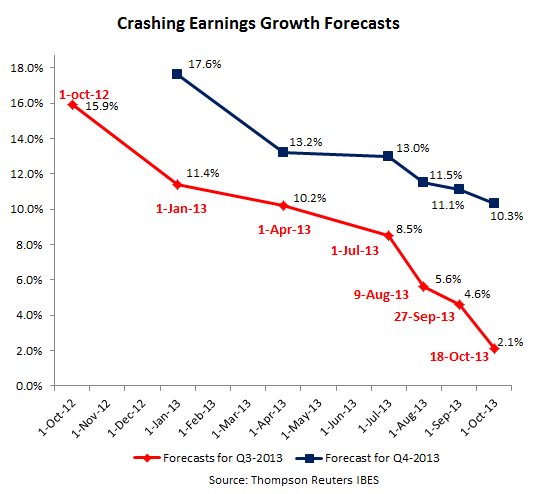 But, um… forecasts of earnings for the third quarter have come crashing down, according to Thompson Reuters IBES. On October 1, 2012, earnings for Q3 2013 were still expected to grow at a phenomenal 15.9%, a sign of blind devotion to optimism. By the propitious day of Friday, September 13, 2013, growth expectations for the same quarter had plunged to 4.7%. Earnings forecasts are cascading down for Q4 as well, but more slowly, and with less desperate urgency, there still being some room for hope and some time for miracles – a series of which is precisely what it would take to achieve the inexplicably high 11.1% earnings growth that has somehow managed to remain on the books as of Friday. Within it, given what the Fed is handing over to Wall Street on a monthly basis, earnings at financial firms were expected to balloon by a breath-taking 26%. The Fed better get busy to make that pan out. The graph shows how analysts, a ridiculously optimistic bunch, have tempered their enthusiasm for earnings growth. Further downward revisions are likely. Earnings stagnation would be next. Absent any miracles over the next three months, Q4 earnings forecasts are going to get kicked down brutally to bring them in line with some sort of achievable reality. Meanwhile, earnings forecasts for next year, though they have come down as well, are still showing growth of 11.3% as of September 13. Delusions in lala-land – unless the desperately hoped-for series of miracles transpires. And how has the stock market reacted to the revenue and earnings debacle unfolding under its very nose? Since October 1, 2012, the S&P 500 has jumped 16.8% and the NASDAQ 19.6%. Clearly, US stock markets aren’t forward looking. They’re blind. They’re no longer looking at fundamentals. They’re bedazzled by only one thing: how much money the Fed and other central banks will print. Nothing else matters. The proof is in the pudding. On Sunday, word spread that Larry Summers had called President Obama to let him know that he was withdrawing from the race for the chairmanship of the Fed. He has been assumed to be slightly less gung-ho about the Fed’s drunken money-printing binge than some of the other names in the hat. He might even have pushed to raise interest rates earlier, if at all. Forget the corporate revenue and earnings debacle. Stock futures soared. This disconnect between stock markets and corporate realities is the Fed’s greatest accomplishment. It’s called the Wealth Effect. It doesn’t matter what the economy does, or what companies do. Stocks always go up, and everyone is happy. There’s no longer any need for investors to keep an eye on fundamentals. They’re focused on the dazzling Fed that, as port of its stunning power-grab, has managed to monopolize everyone’s attention over the last five years. As long as the Fed continues to print $85 billion a month that need to find a place, and as long as it keeps short-term rates at zero, stock markets might simply refuse to see reality and fall in line with it. 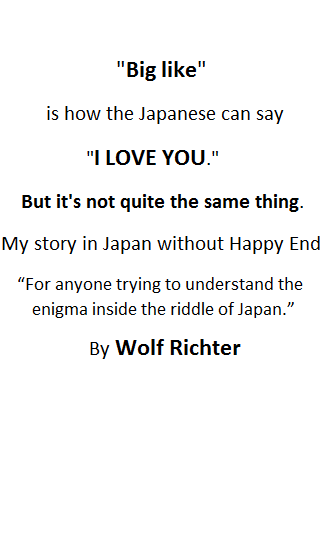 It’s the mother of all delusions. Thank you halleluiah, Fed. But if this is true, then the corollary must also be true: once the Fed gets serious about withdrawing the addictive drug that QE has become, investors will have nothing to get high on. And all that’s left is a big hangover, withdrawal symptoms, crummy revenues, and dismal earnings. It won’t be pretty. What are the chances? Not a week has passed over the last few months when Federal Reserve governors didn’t express their concerns about the bubbles that QE has been inflating, huge bubbles that could take down the entire financial system again if they popped. Even with Janet Yellen at the helm, QE is likely to be tapered out of existence. It’s just that US stock markets have smoked too much of QE and can’t come off their trip for now.